Safe Dock Barrier Lip Leveller. TIEMAN Industries has introduced the Dock Guard Safety Gate to its stable of dock safety solutions, which includes the Safe Dock Barrier Lip Leveller. Both products are designed to prevent accidents on loading and unloading docks, damage to equipment, and personnel injuries. According to Dale Tieman, loading dock accidents can injure and even kill workers. "In almost every case, the incidents could have been prevented with proper safeguards that protect against common accidents at loading and unloading docks," he said. "At Tieman Industries we are committed to helping customers with loading dock safety and we have developed an array of safety solutions that help prevent loading dock accidents. "Tieman now offers a choice of safety solutions that can prevent accidental roll-off and damage." 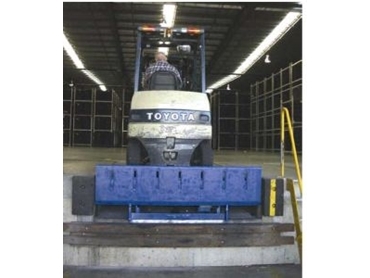 The Safe Dock Barrier Lip Leveller protects goods and equipment from accidental roll-off or driving off the loading dock. In a stored position the Safe Dock Barrier Lip extends above the deck providing a solid steel barrier to prevent accidental fork lift run-off. In the extended position, the lip remains flush to the leveller deck to provide a smooth transition for fork lift operation. After loading or unloading is complete, dock attendants can push a button to activate and raise the dock leveller. The Lip then returns to the vertical barrier position when stored away. The Dock Guard Safety Gate is the optimum and most cost effective solution to the safety hazards on loading docks. “In a busy loading dock, an open, unprotected dock opening is an accident waiting to happen," Mr Tieman said. "Overhead door damage is often the highest maintenance expense at busy distribution docks. The Dock Guard Safety Gate can protect dock doors, door tracks and hardware from being damaged due to accidental fork lift impact," he said. The Dock Guard Safety Gate can be independently operated by the dock attendant through a control panel mounted on the dock wall. It can also be operated by a coordinated, interlocked master control panel with the operation of the dock leveller or vehicle restraint. "Once the truck is restrained and the dock door opened, the Dock Guard Safety Gate opens automatically for fork lift truck access. Once the door or restraint is restored the gate automatically closes." The dock guard safety gate barrier arm is designed to automatically reverse if it contacts an obstruction during the lowering cycle.